When we first bought our property, I planted a double row of White Pines between the yard and the field east of the house. The pines have since grown into some large trees. 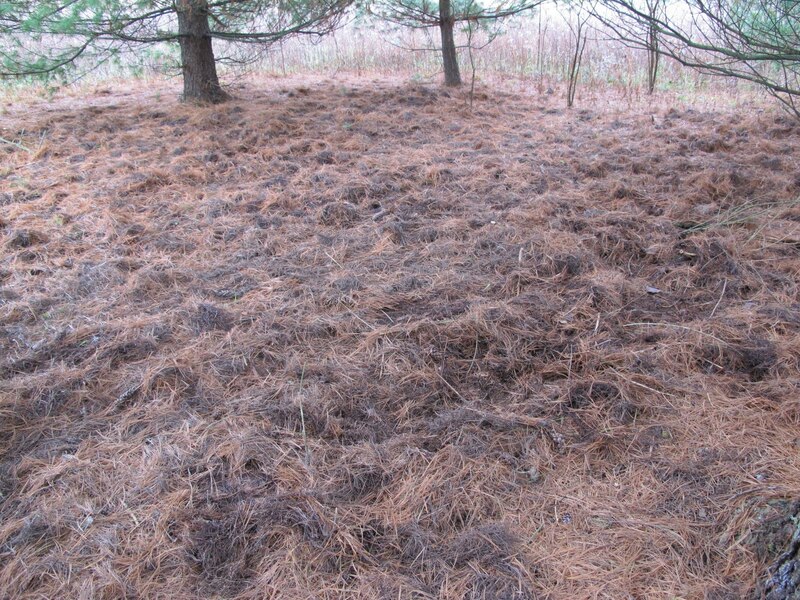 Pine needles form a thick layer in the shade beneath their branches. 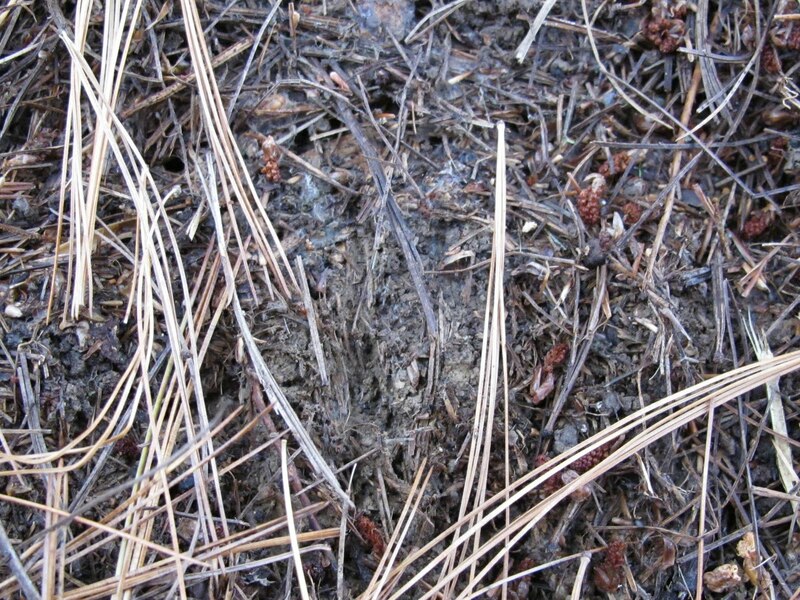 I use some of the needles for mulch around the blueberries and an occasional animal will dig up some food item, but for the most part this layer of needles has remained practically undisturbed for years. It was surprising to find the needles in disarray. A pass with the roto-tiller wouldn’t have caused much more disturbance. 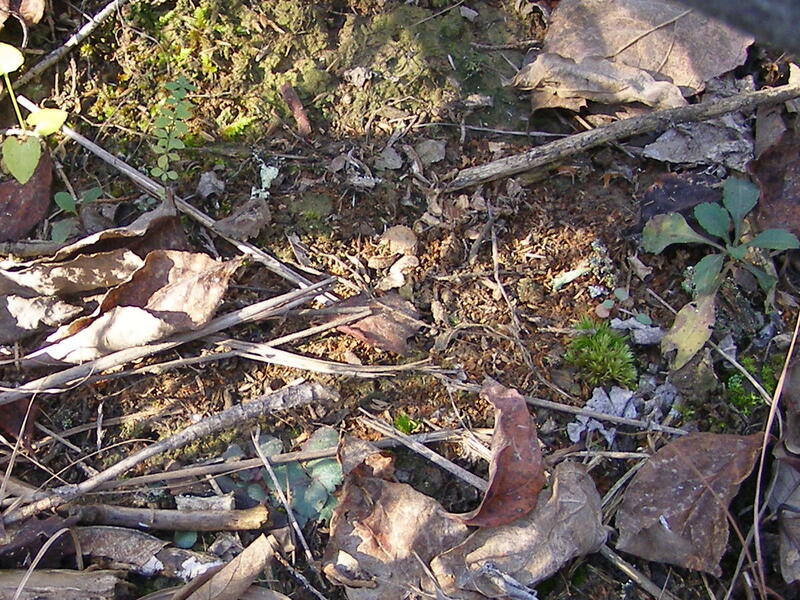 Old partially decomposed needles have been mixed with fresh and left in closely spaced piles. Between the piles are patches of bare ground. It’s pretty obvious what happened. 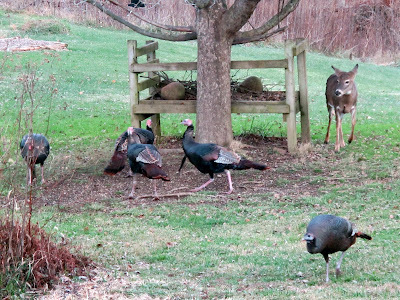 This was the work of a flock of Wild Turkeys. 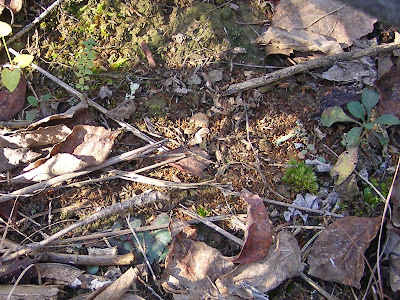 Turkeys have an instinctive need to scratch the ground when foraging for food. Even if they were standing on top of a pile of grain, they would periodically stop to scratch. The process of scratching is pretty much stylized. The turkey raises its head, shifts one foot and drags the toenails along the ground and then does the same with the other foot. Two scratches are typical, but four scratches are not uncommon. 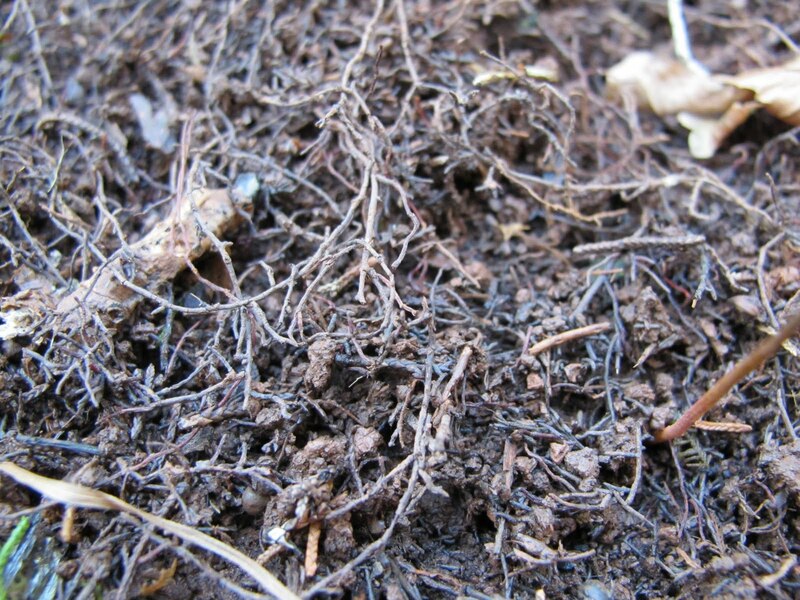 Scratch marks are very common in areas where they have reached the soil. I’m not sure what they were after. 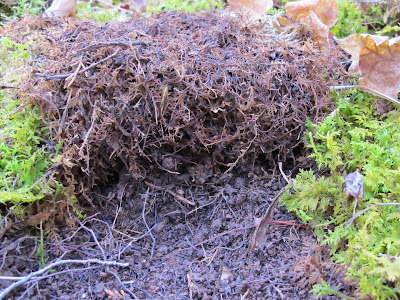 Fungi were unusually abundant beneath the pines this fall, so that may have been the attraction. 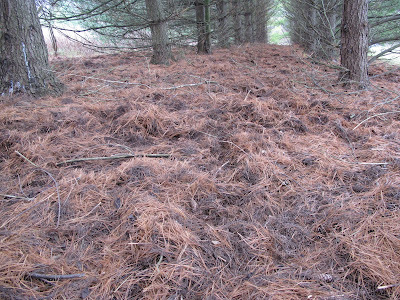 I’ve never found insects or worms abundant in the pine duff. I may never know for sure. There’s been a flock of about 30 hens roaming the neighborhood. I think they‘re probably the ones responsible for this. They must have been pretty busy birds, since they accomplished this task in a single day. 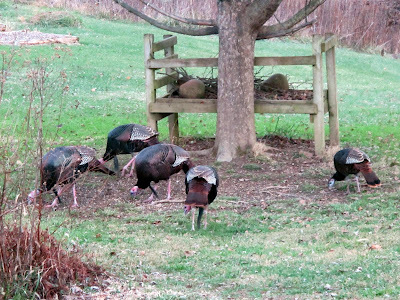 The row of trees stretches about 250 feet and the turkeys didn’t miss any of the needle bed. 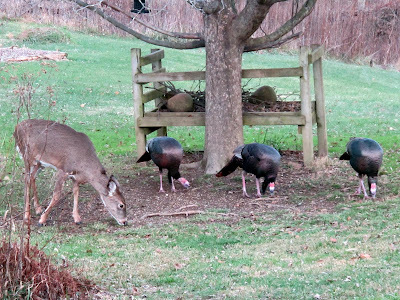 It’s just odd that after years of turkey flocks loafing and preening beneath the pines, they suddenly decided to tear things up looking for food. 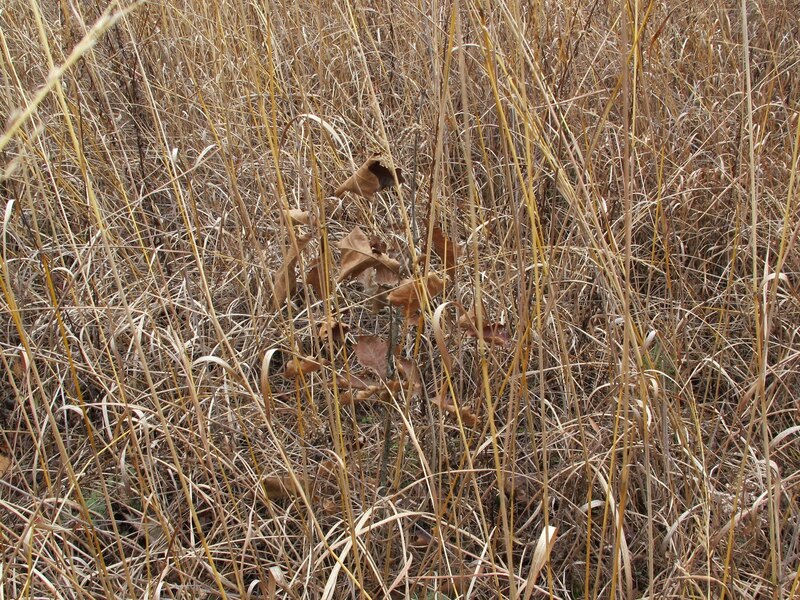 This is normally a great time of year to be doing brush management in the fields. Unfortunately, the rain activity has been far greater than normal and has prevented me from doing that type of work. I’ve had to content myself with going around to examine the effects of past year’s management activities. 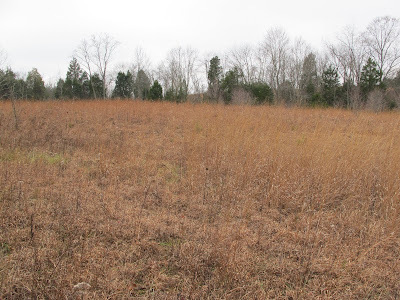 The Far Field was mowed two years ago and invasive woody growth was sprayed with glyphosate. I’m happy with the way things are progressing. A big part of the Far Field is short grass. 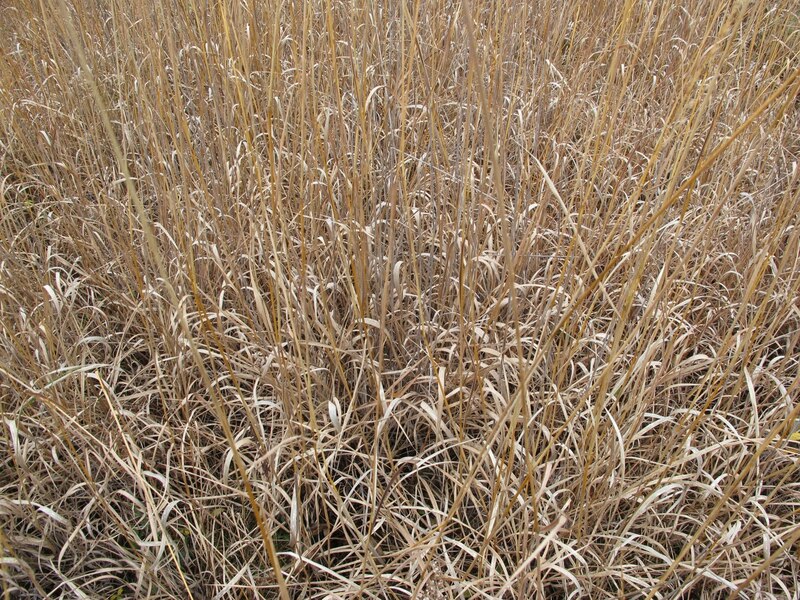 Little Bluestem dominates, but there is also quite a bit of Elliott’s Beardgrass. Before management, this area was thick with medium sized cedars, maples and Tuliptrees. Those species have not been very aggressive in trying to reclaim their former territory. Freed from the competing trees, the grass has filled in nicely. I’m trying to encourage the growth of scattered oaks in the field. Part of the reason for the oaks is to increase the possible habitat for the Edwards’ Hairstreak butterfly. 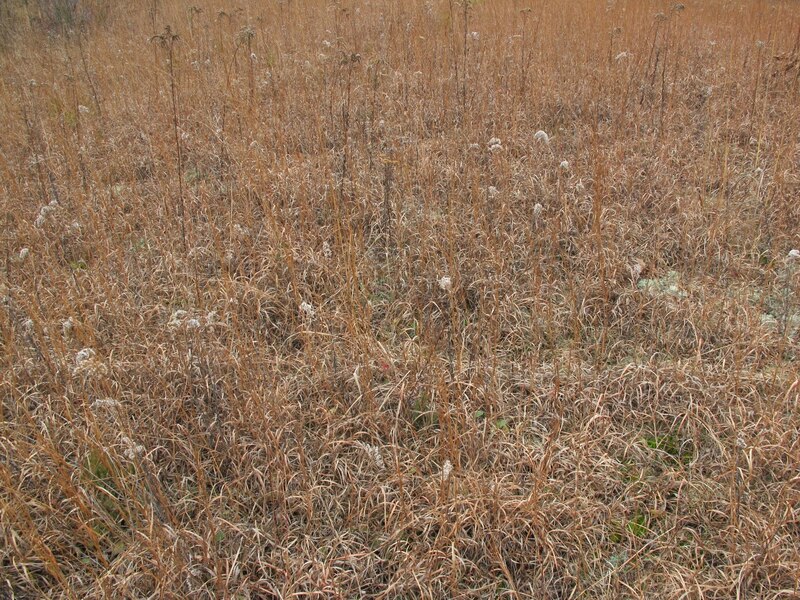 The butterflies are already present in adjoining fields, so there is a good likelihood that they will expand into this field. 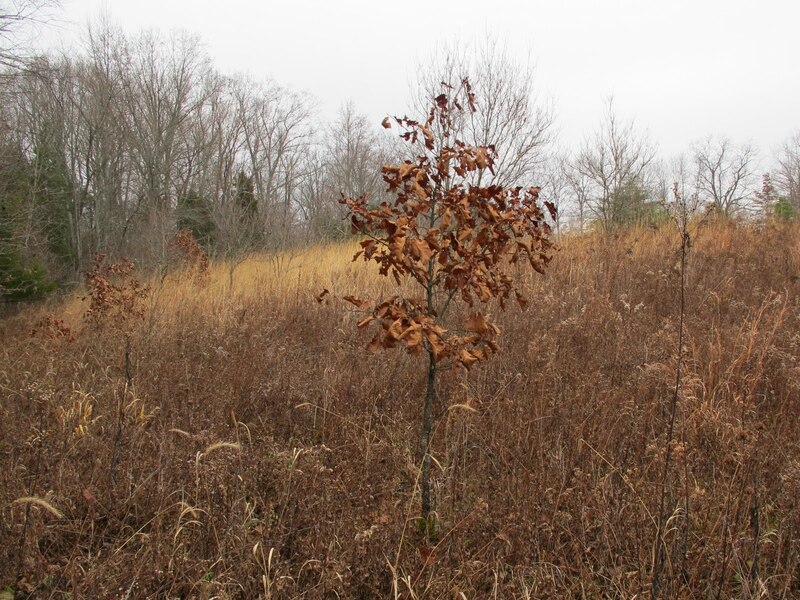 I also believe that oaks have special associations with prairie ecosystems and I want to give those associations a chance to develop at Blue Jay Barrens. It’s fortunate that the oaks hold their leaves into winter. 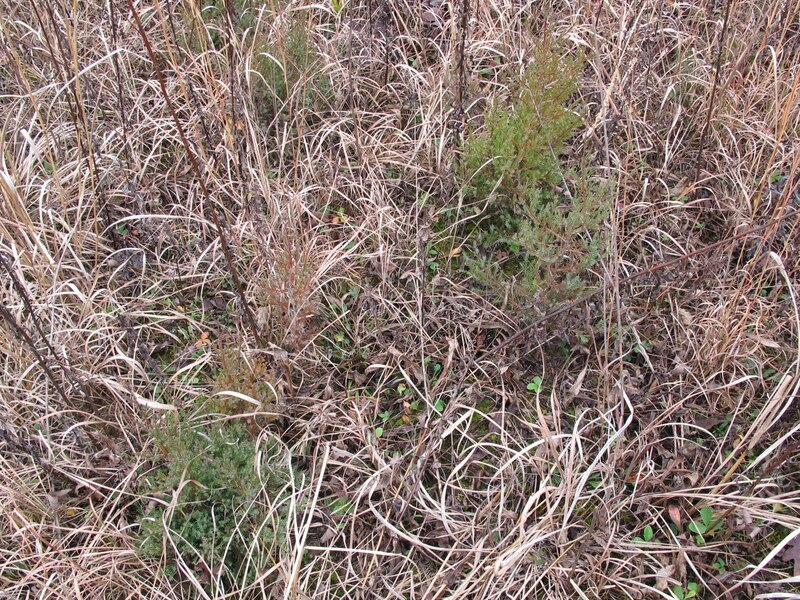 Otherwise, I’d have a tough time finding the smaller specimens hidden in the grass. I’m hoping to go a few more years without mowing this field, so the smaller oaks can have a chance to increase their size. The larger the tree, the less likely I’ll be to accidentally mow it down. 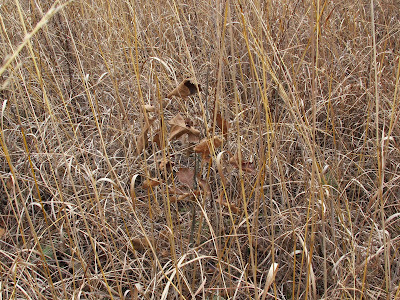 Fescue still exists in parts of the field, but it is slowly being overtaken by native plants. 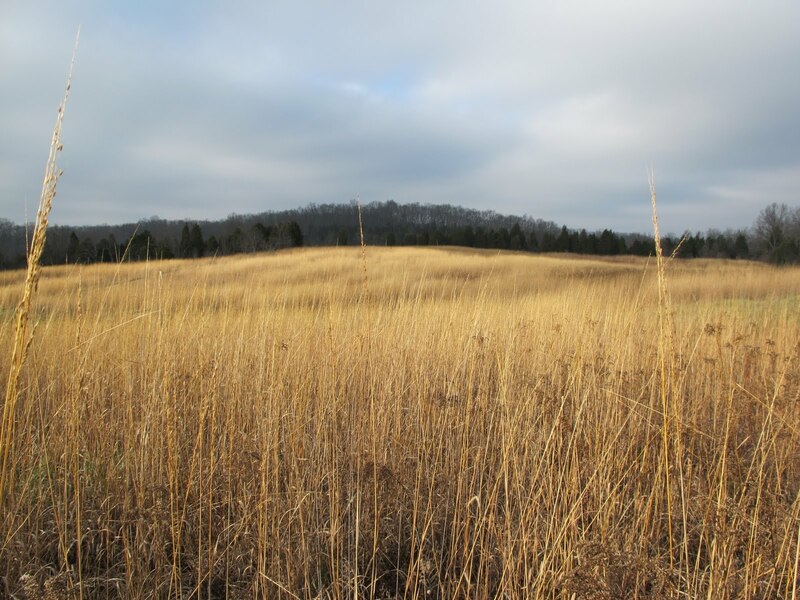 This field shows a strong trend towards becoming native grassland. Except for my initial clearing, I’ve had to do relatively little work here. Fortunately, I’ve got plenty of other areas that present me with more of a challenge. 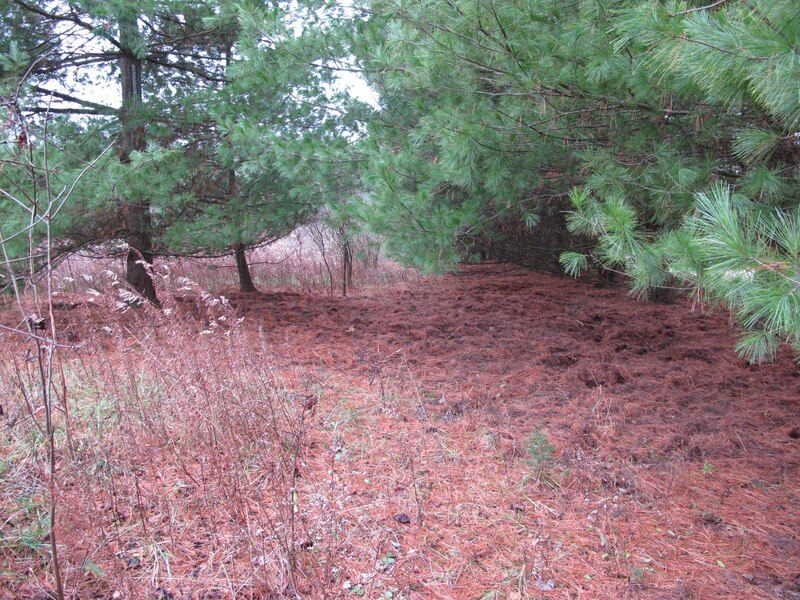 Most of the work I do to maintain prairies and barrens at Blue Jay Barrens revolves around controlling the growth of Eastern Red Cedars on the property. 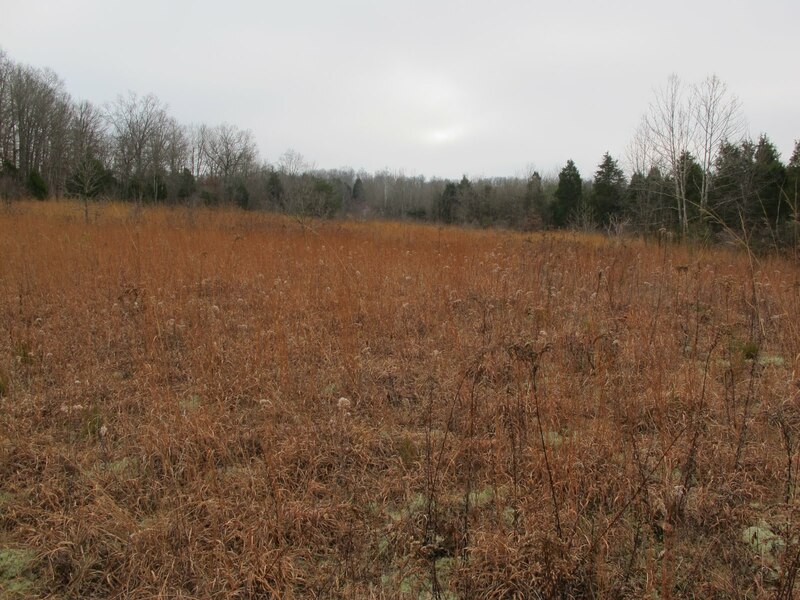 Early on in my management efforts I removed thousands of medium sized cedars that threatened to eliminate the prairie vegetation. 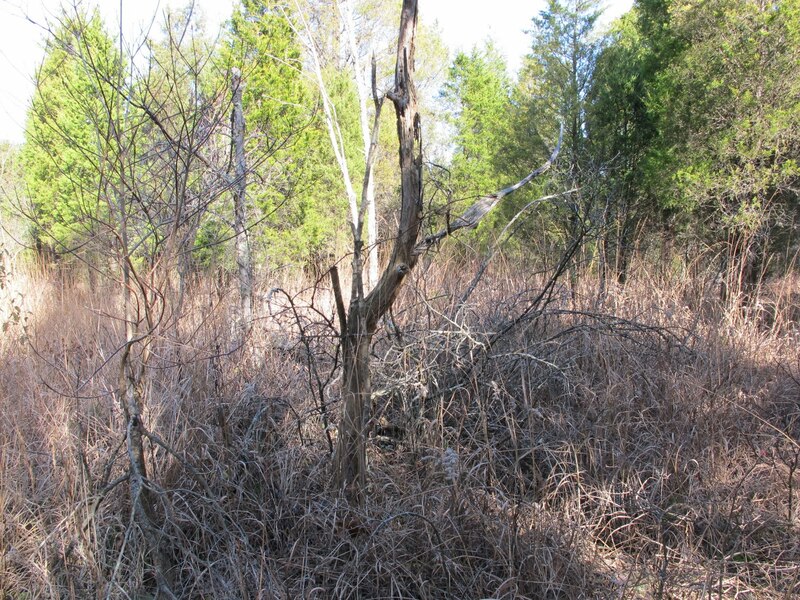 The fields were opened to the sunlight and the threat from large cedars was minimized. 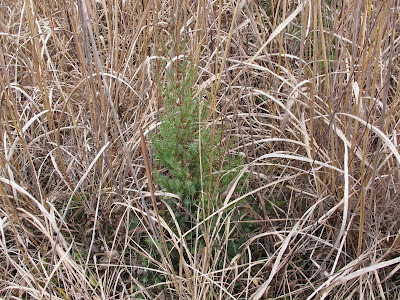 Now I deal with the constant influx of young cedars into the prairie fields. Birds eat cedar berries and then pass the seeds out with their droppings. The seeds are quick to sprout and produce new trees. Fortunately, most of the seedlings cannot compete with the plants in the field and they soon die. There are still plenty of survivors left. 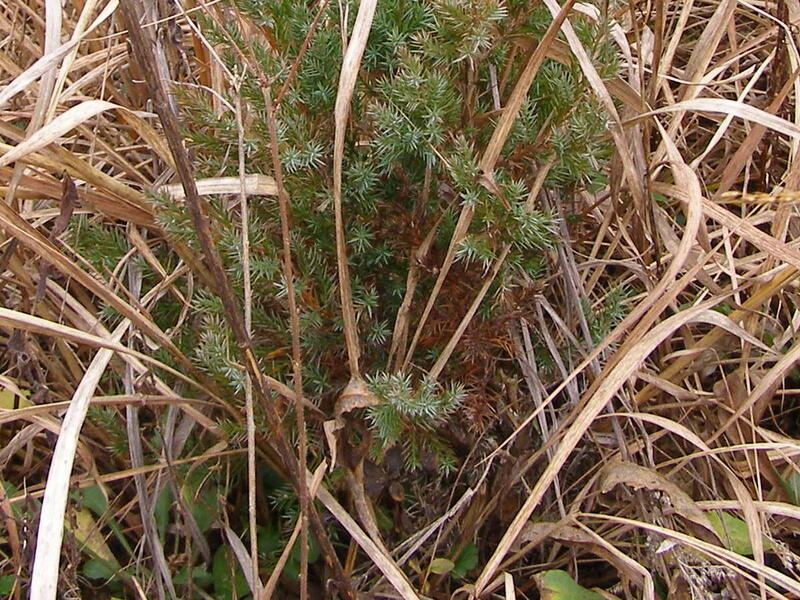 I like to go through the fields and cut the little cedars when they’re about a foot tall. At that size, the cut cedar quickly decomposes and disappears. 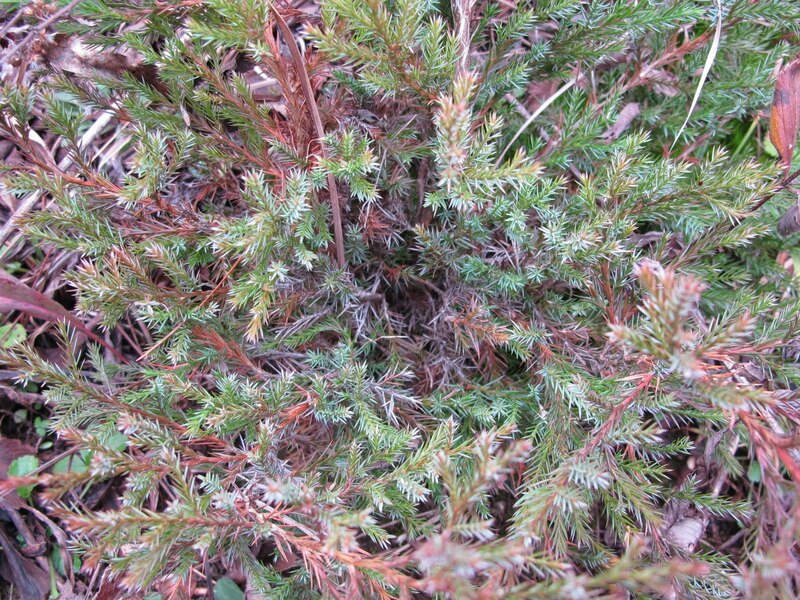 When small cedars are cut by the mower, they rapidly regrow into a tight mass of branches. 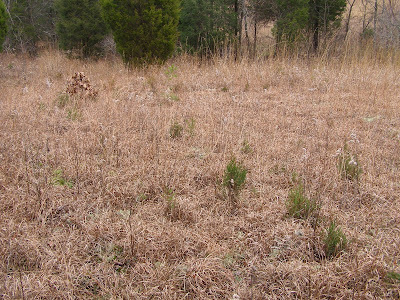 It works best to cut the small cedars the year before I mow the field, but the weather doesn’t always cooperate with that plan. The grass and other plants are extra tall and lush this year because of the excessive amounts of rain we had during the growing season. 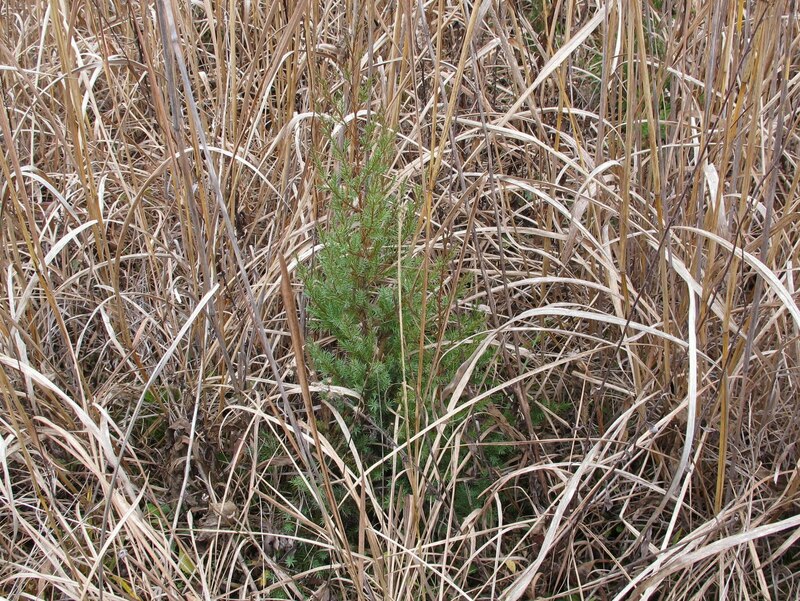 Trying to do cedar maintenance this winter would be a waste of time because of the difficulty in finding the cedars in the tall grass. 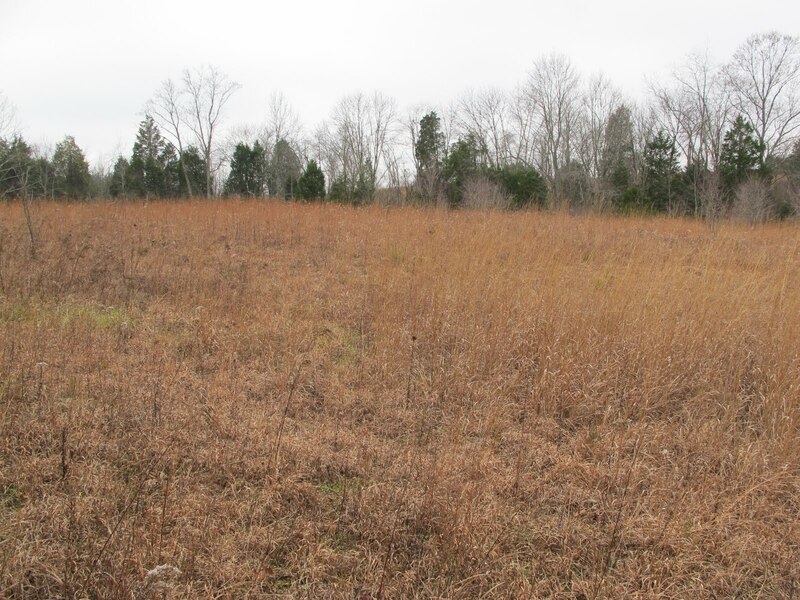 It’s easy to see the cedars in the more open areas of the field. This density of cedars is not typical of the entire field, but you can usually figure that conditions in the open areas mirror what’s in the tall grass. If you’re going to walk the field cutting cedars, it just makes sense to do the work when you have the best chance of seeing all of the cedars. Cedars in the short grass fields are much easier to deal with. Regardless of growing conditions, it’s always easy to see the trees. 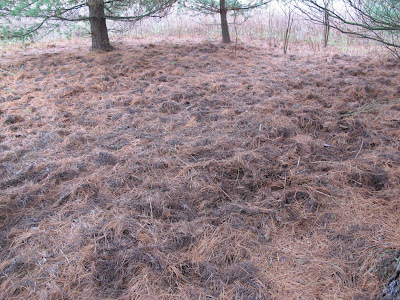 The soil conditions that keep the tall grass from becoming established, also keep the cedars from growing very rapidly. It’s been ten years since cedar maintenance has been completed in this area. 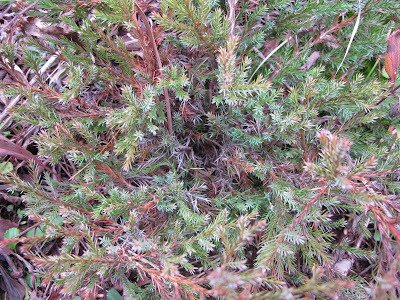 The tough conditions make it hard for the cedars to get established. 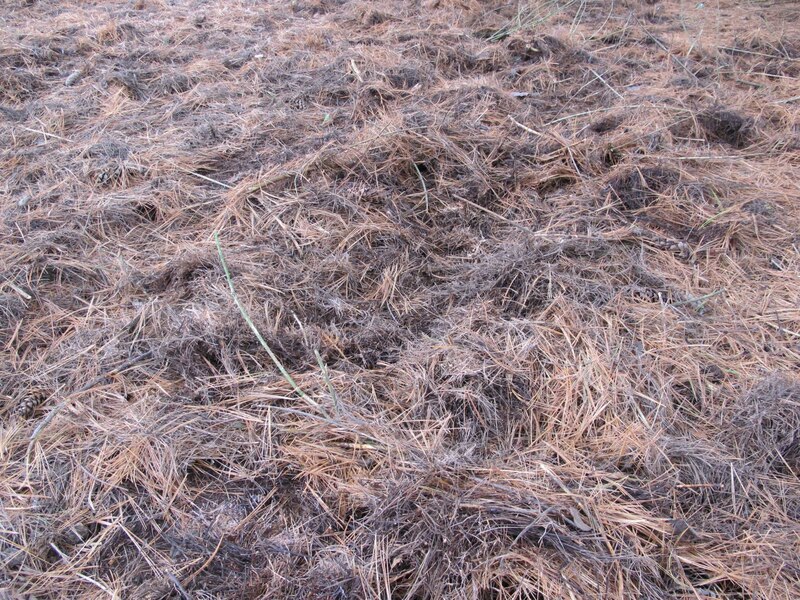 I’ll probably do my cedar maintenance in the short grass fields this winter. Fortunately, there’s never any shortage of work to be done. The weather forecasts kept predicting Thanksgiving Day to be mostly sunny. That forecast finally changed around mid afternoon when the clouds still had not parted. 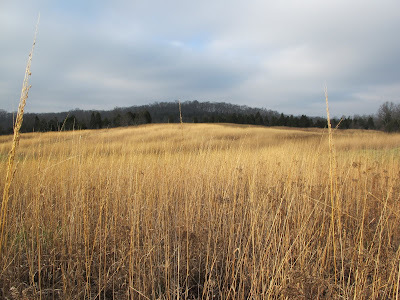 I was looking out over the Indian Grass field, thinking about how the frequent rains had leached so much color from the golden stalks, when sunlight suddenly engulfed the field. It really improved the mood of the day. 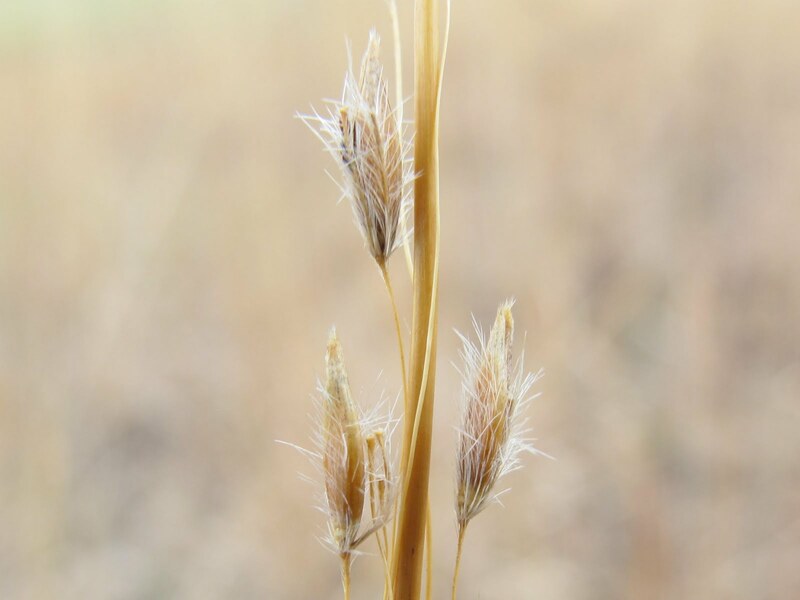 Wind and rain have stripped most of the Indian Grass seeds from the seed heads. Rainfall for November is already well above normal and we have yet another storm moving our way. Each storm has been accompanied by buffeting winds and most have been followed by a day of strong straight line winds. Anything not well anchored has been blown around. 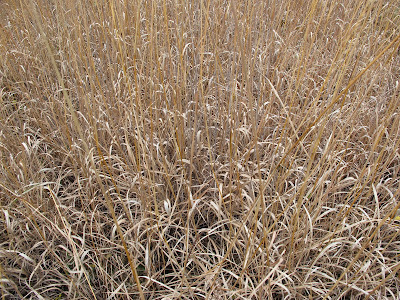 Several plants have held onto florets that never managed to produce seed. These are mostly found in the patches of Indian Grass that flowered late in the season. 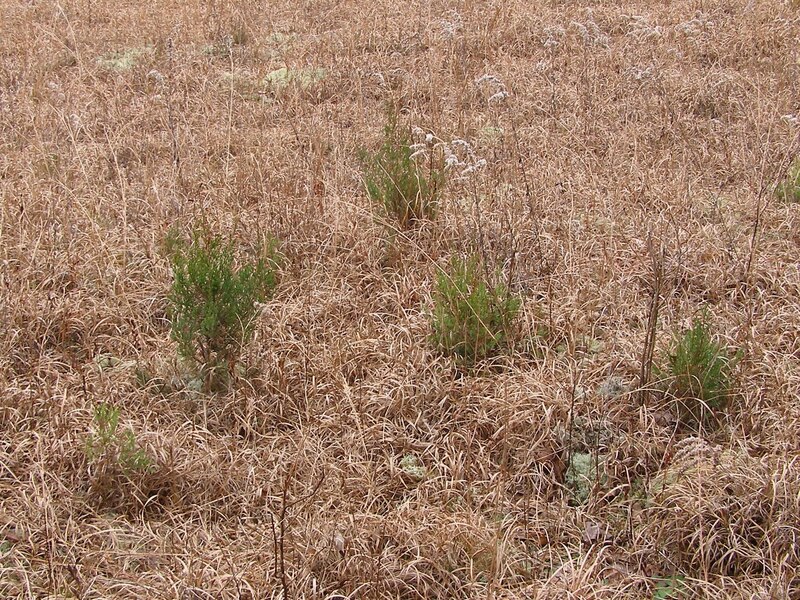 Even in those areas though, the majority of plants managed to produce viable seed. 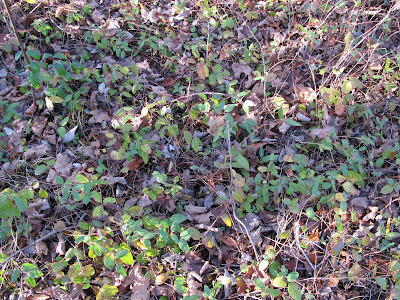 The seeds are now found on the ground or caught in the leaves at the base of the plants. 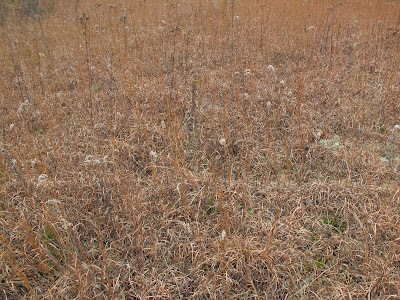 This is where the birds will spend the winter foraging for Indian Grass seeds. 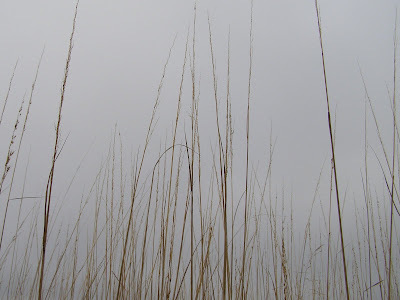 On quiet winter days, you can sit in the field and hear the birds moving noisily through the grass. As I thought about the birds, a flock of blackbirds went past overhead. 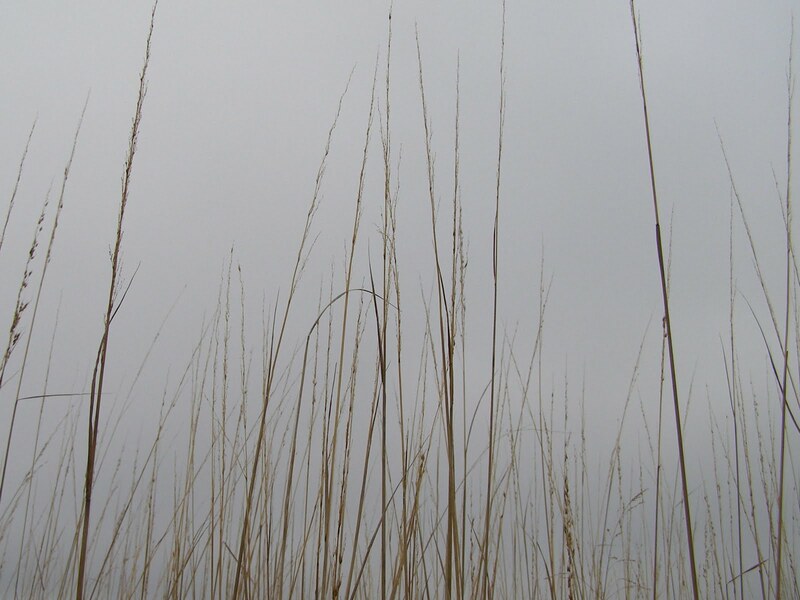 The seed foragers are primarily sparrows, but the blackbirds will also make use of the field of tall grass. Sometime during the winter, blackbird flocks will move through the cedars feeding on the berries. They find the Indian Grass fields to be an ideal roosting site and will sometimes settle in by the thousands. It’s an amazing sight, but all I can think about is the thousands of cedar seeds that will be left behind in my prairie fields. Each seed represents a potential cedar tree that I will be eliminating in the future. I have always enjoyed the look of a thick carpet of bright green moss covering the ground in a shaded woodland. It’s now getting more difficult to find that scene at Blue Jay Barrens. 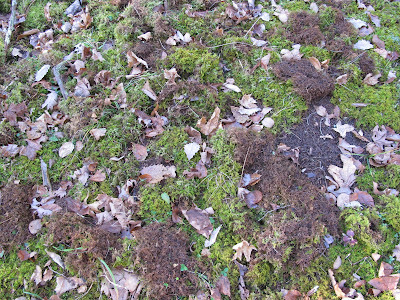 Some animal has decided that these moss beds need to be disturbed. I’m still not certain as to what species of animal is making this mess. It almost looks like a wild dance had gone on here. 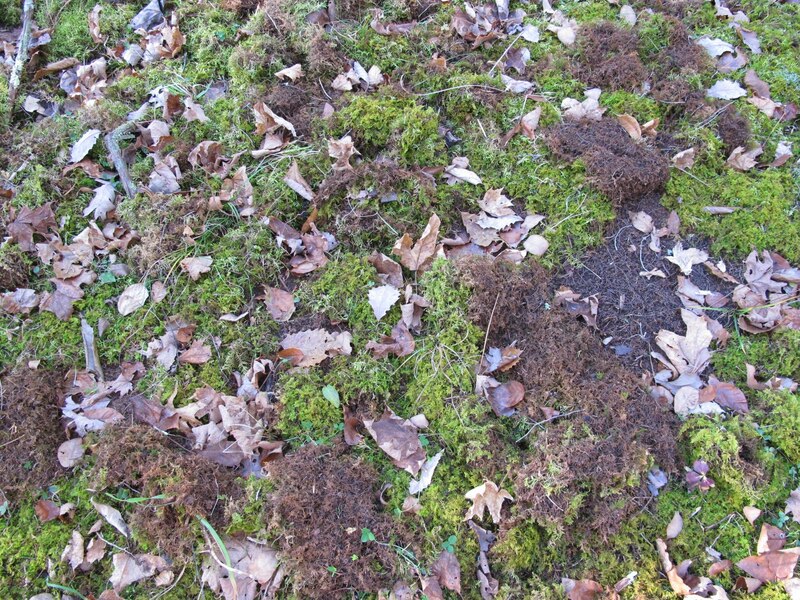 Chunks of moss have been torn up and scattered about. Other sections have just been rolled back to expose the soil. Rolled pieces are not torn or mashed. It’s as if each section had been carefully pealed back. The exposed ground shows no signs of being disturbed. 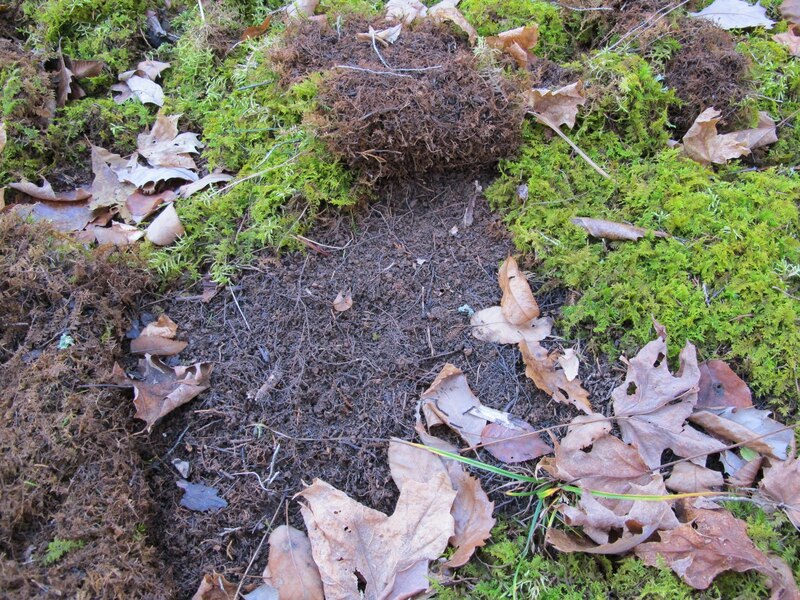 There are no tracks, marks or scratches left by the mysterious moss turner. I can’t imagine any mammal being able to accomplish this feat without leaving some sort of sign. 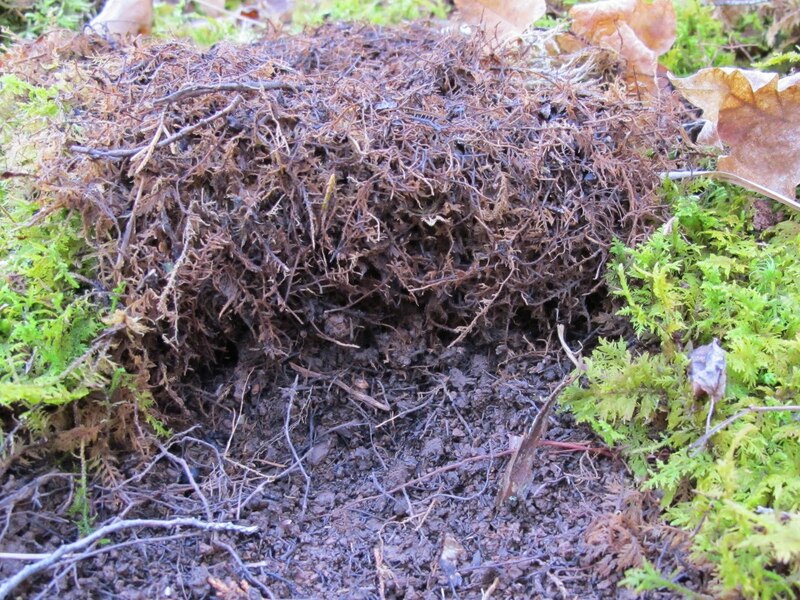 It’s possible that some bird is peeling back the moss to get at worms or grubs. 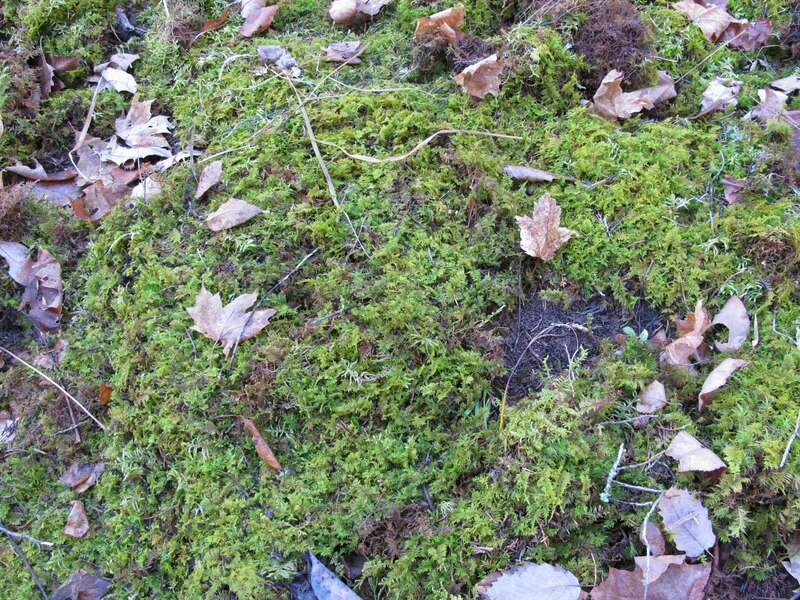 I can imagine a Crow laying back the moss in this manner. The pieces easily fit back into place and show no signs of trauma from the turning. I guess I won’t know for sure what’s happening until I can catch the perpetrator in the act. It’s a shame that some invasive exotic plant species have to be so attractive. These Japanese Honeysuckle fruits almost sparkle in the sunlight. The glossy skin easily reflects the silhouette of the photographer’s head. The honeysuckle would be a joy to see, if it was a native plant. As it is, I’m just aggravated by the showy display. 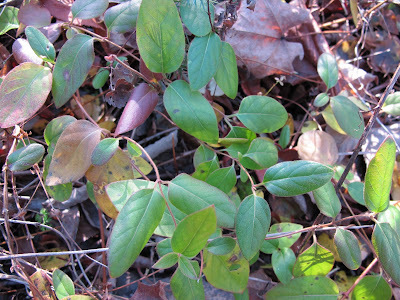 Japanese Honeysuckle seems to be a replacement plant for other invasives. As I remove Multiflora Rose, Autumn Olive and Bush Honeysuckle, the Japanese Honeysuckle jumps up and takes over that space. The bushier invasives seem to out compete the Japanese Honeysuckle vines. 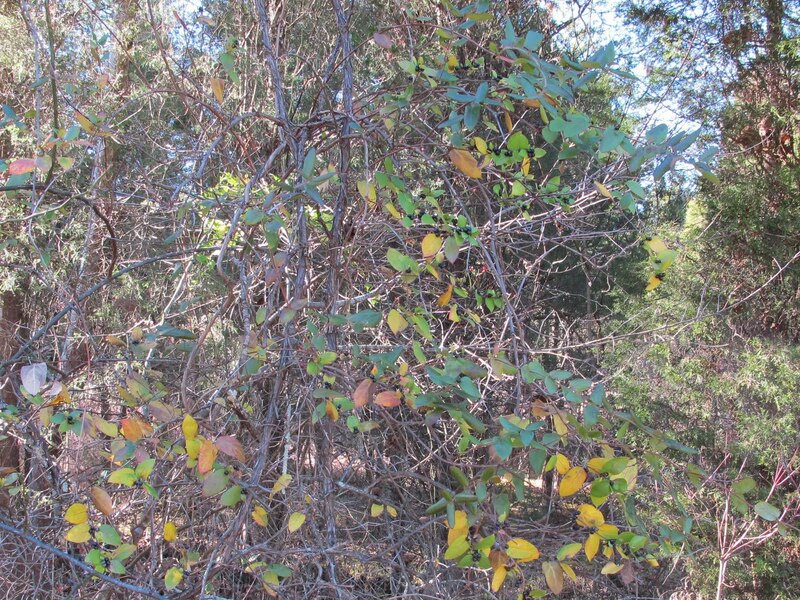 Once the bushes are gone, the spindly vines are free to grow with abandon. 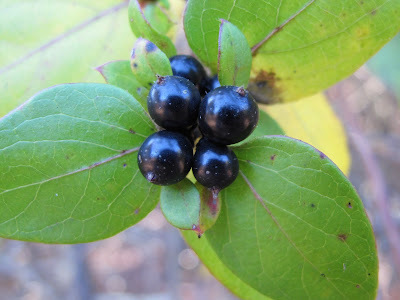 If a fruit eating bird eats from one type of woody invasive, it seems to eat from them all, so it makes sense that the seeds from all of these invasives would be dropped in the same general area frequented by the birds. The key to slowing the influx of invasives onto a site is to eliminate the berry producing individuals. If no fruit is being produced, there is no reason for the fruit eating birds to concentrate in that area. 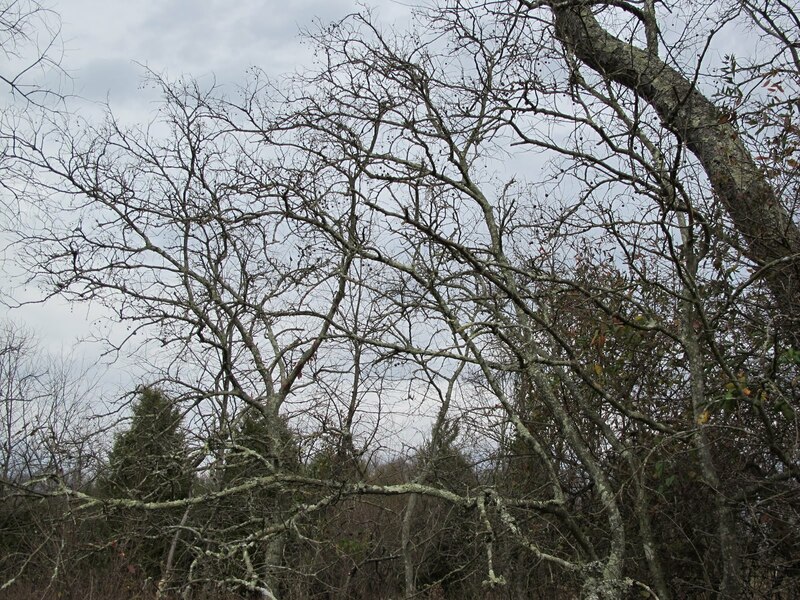 Most of the bird flocks feeding on the invasive fruits seem to concentrate on a single type of fruit until it’s gone. 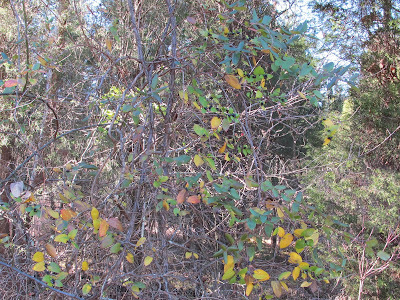 I’ve watched huge flocks of Starlings or Robins come through an area and feed on Bush Honeysuckle that was growing alongside fruit laden Eastern Red Cedars. 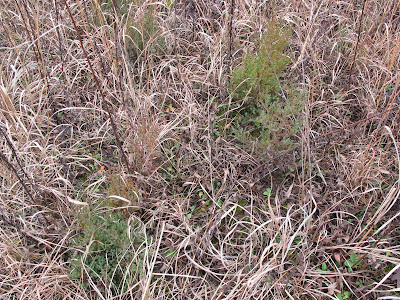 All honeysuckle berries were consumed, but the cedar fruits were left untouched. 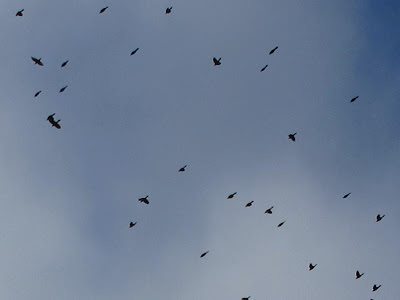 Weeks later, the same flocks came through feeding on cedar fruits. My goal is to eliminate fruit production by invasive species and the Japanese Honeysuckle is my next target. If the birds are feeding on native fruit, they will be dropping native seeds. I know that eliminating fruit production won’t stop the influx of invasive species, but I believe it will significantly reduce the amount of new seed coming onto the property. Japanese Honeysuckle vines growing along the ground don’t seem to produce fruit. It’s not until they ascend some type of structure that you see flowers developing. My first priority will be to cut back all climbing vines and eliminate fruit production. With luck, this will be my last opportunity to photograph Japanese Honeysuckle fruits. Once I’ve beaten the honeysuckle back to the ground, I can work on ways to kill it completely. Mowing the vines every couple of years keeps them under control, but it doesn’t stress the plants enough to kill them. If I have to live with Japanese Honeysuckle, I’d rather it was in this form than draped over the trees and fences. I always overstock the feeders on holidays. 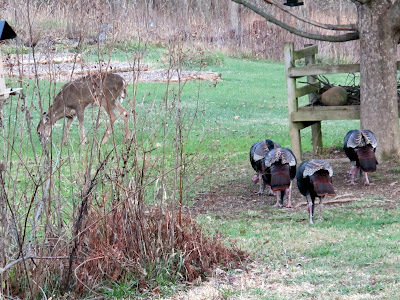 That way, family and guests can enjoy the wildlife that I see almost every day. It seems right to have Wild Turkeys feasting outside the window on Thanksgiving. Like many people on this day, they seem intent on consuming as much food as they can possibly hold. 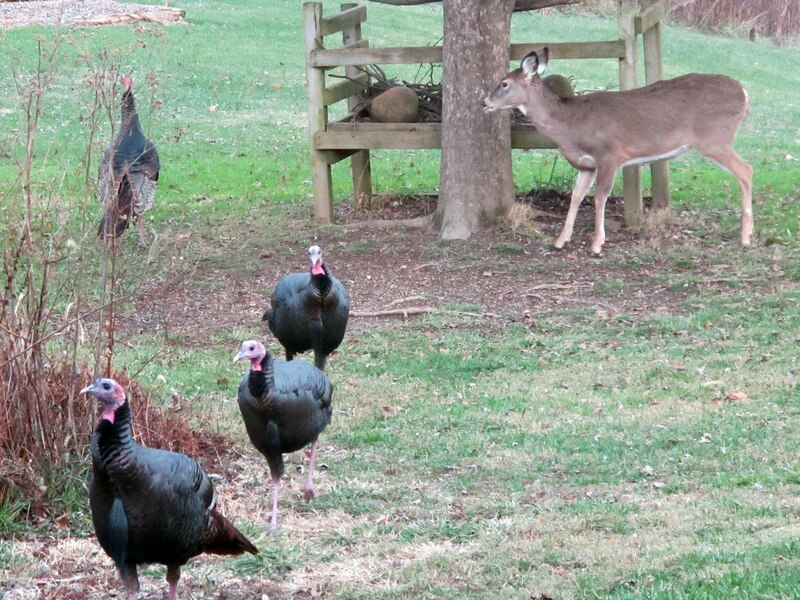 The arrival of a deer causes some concern among the flock. We sometimes have guests who cause a similar disturbance. The turkeys decide to give up their place to the deer and move to another food source. I occasionally manage a similar maneuver when I slip away from the adults and pull up a chair at the kid’s table. A single Tom refuses to move. The deer seems willing to share the table. 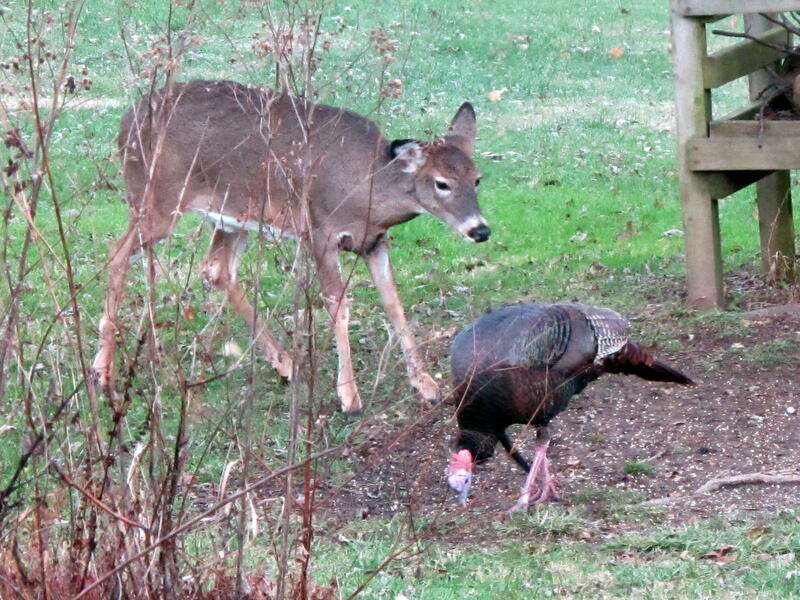 When the turkey’s back is turned, the deer shows its true feelings. 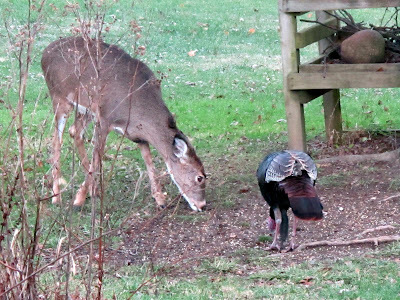 I don’t think the deer is really into sharing. Eventually, more turkeys return to their original feeding station. Things finally get too crowded for the deer and it moves off to eat clover out of the lawn. It seems that things worked out well for everyone. I hope things run as smoothly for the crowd inside the house. The Dwarf Hackberries have recently had a couple of rough growing years. Late frosts and extreme droughts managed to almost eliminate fruit production in 2009 and 2010. 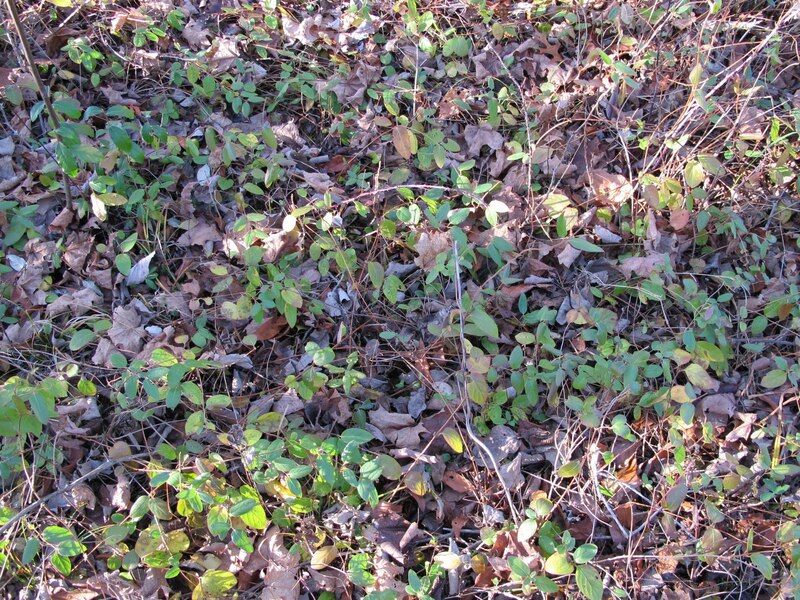 2011 provided milder temperatures and plentiful rainfall which resulted in an abundance of Dwarf Hackberry fruit. You can’t say that the branches are straining to hold up the bounty, but this is a heavy crop for the typical Dwarf Hackberry. Dwarf Hackberry is one of the Blue Jay Barrens rarities. I do what I can to keep the trees from being adversely impacted by things like competitive vegetation, but I haven’t yet learned to control the weather. 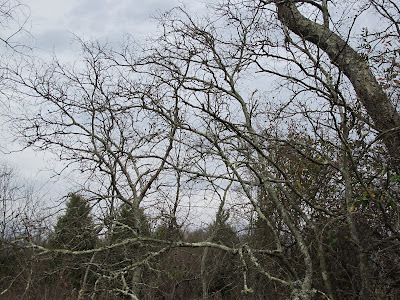 We’re at the northern extreme of the Dwarf Hackberry’s range and weather is a primary factor influencing the survival of this southern species. I hope the birds distribute these seeds to suitable locations around the property. When you combine the hackberry’s naturally unusual growth pattern with damage caused by weather extremes, you get a decidedly odd looking tree. People are constantly suggesting that I remove these obviously inferior tree specimens. My assurance that the trees are just doing what they are meant to do seems to carry little weight in the discussion. Fortunately, I’m able to dismiss these suggestions as having no merit and can continue to manage things as I think best. Lichens seem to find the branches of the Dwarf Hackberry to be desirable places to colonize. 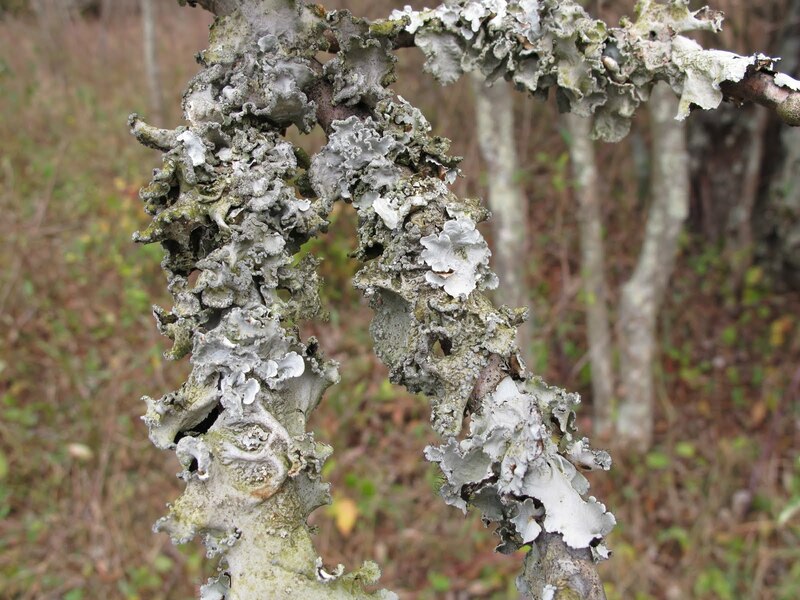 Dead branches are always covered with lichens, but the lichens also grow on the living branches without any apparent damage to the tree. There appears to be a variety of lichen colors and shapes represented here. 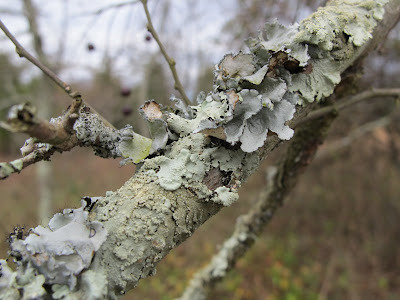 I’m wondering if this lichen covering is typical of Dwarf Hackberries across their range. 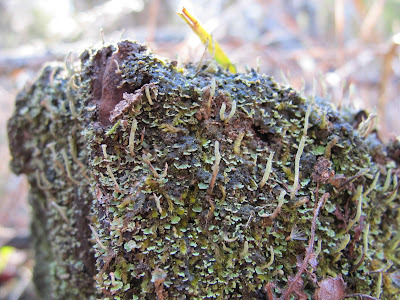 I may look into that when I have time to squeeze lichen identification into my schedule. It’s not unusual at Blue Jay Barrens to see things that are odd enough to warrant a more thorough investigation. 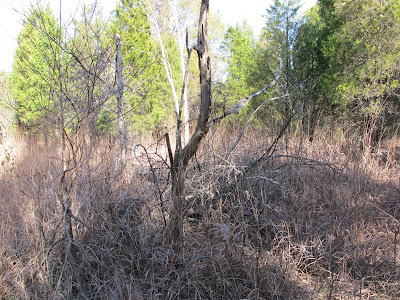 A cluster of dead trees rising from a stand of Indian Grass is one such oddity. 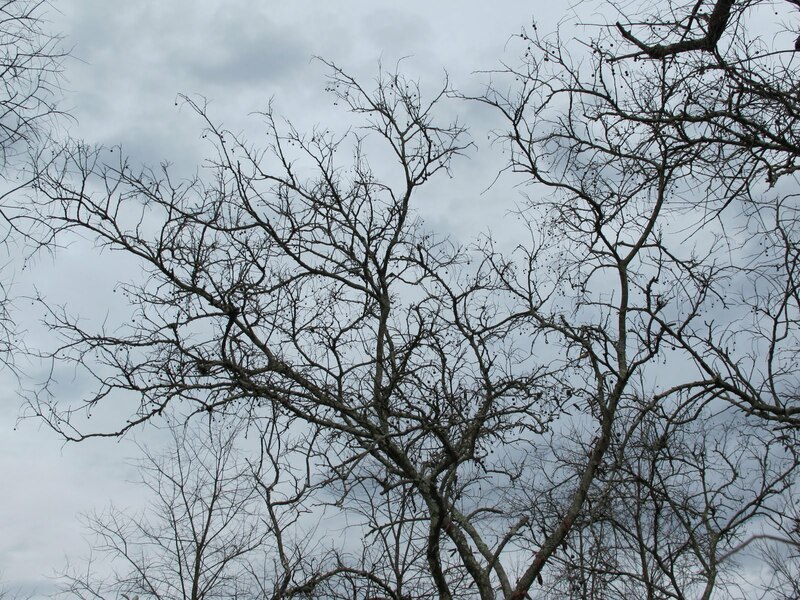 It’s not uncommon to find a single dead tree, but questions are raised when an entire group of trees has died. There are clues you can pick out from a distance. The trees are in a rough circle about fifteen feet across and all growth tends to lean away from the center of the circle. 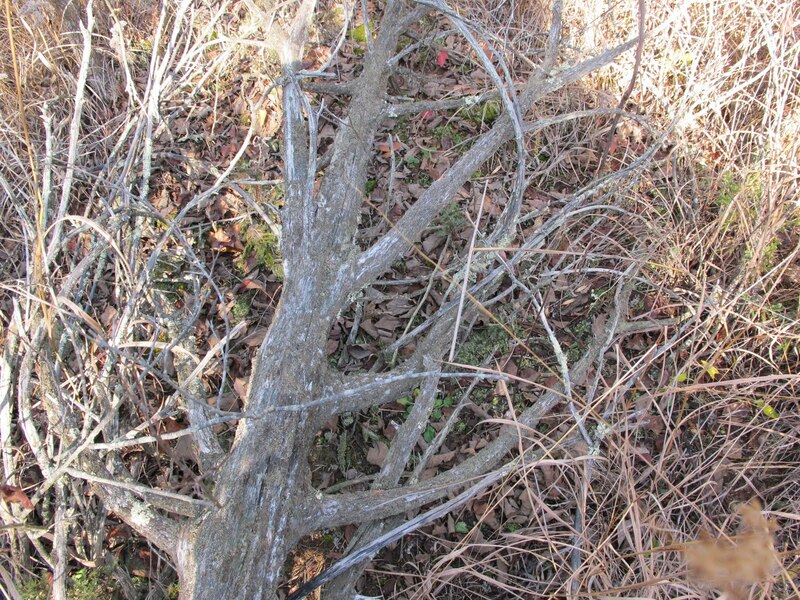 Trunks have an irregular shape caused by the death of top growth and redirection of a lateral branch upward. 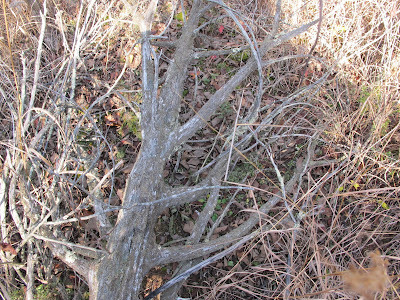 These are all signs of trees that began life growing around a large obstacle in the center of the circle. Here’s the answer. Not far away is the top of a cedar that was left after the tree was cut and the trunk removed. 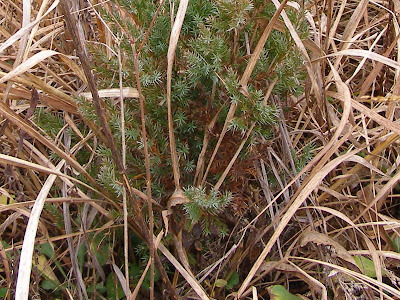 When the cedar was removed, trees that once grew protected by the cedar’s bulk were exposed to harsh sunlight and drier soil conditions. The stress of their new situation was too much for them to endure, so after some diebacks and attempts at resprouting, the trees finally died. The top has remained at this spot for at least 28 years. 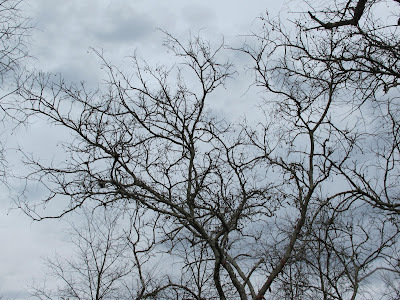 The leaves and small branches have long since disappeared, but the skeleton of the tree still blocks enough sunlight to form an almost cave-like environment beneath its branches. 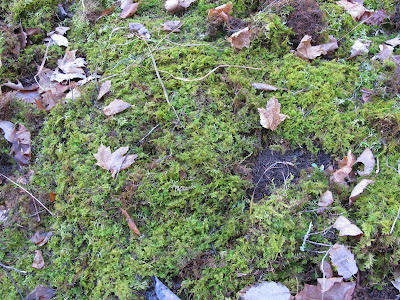 Moss and a few random plants manage to survive here. The curving cedar branches intercept much of the rainfall and funnel it away. This leaves the soil beneath the tree top much drier than would be expected. There’s not much growth here to show for 28 years of effort. 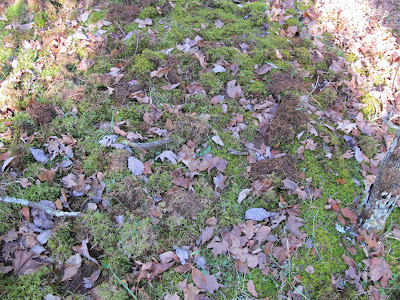 The old stump is almost invisible beneath a carpet of mosses and lichens. 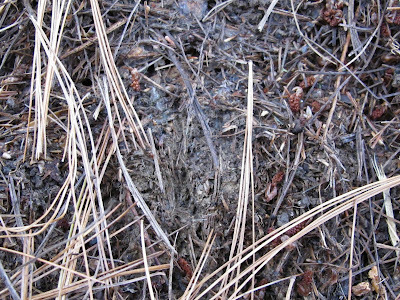 A cavity formed in the center of the stump now supports some grasses and sedges. 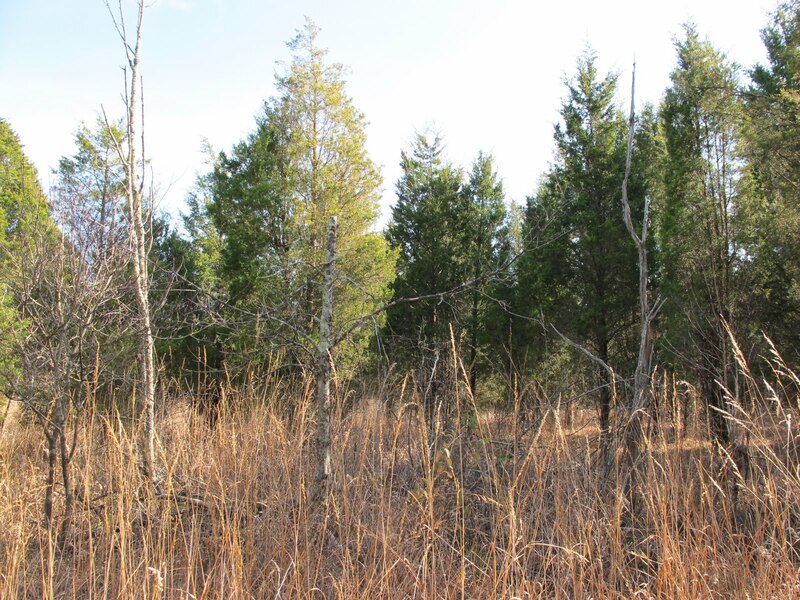 These former cedar sites always display some interesting diversity. 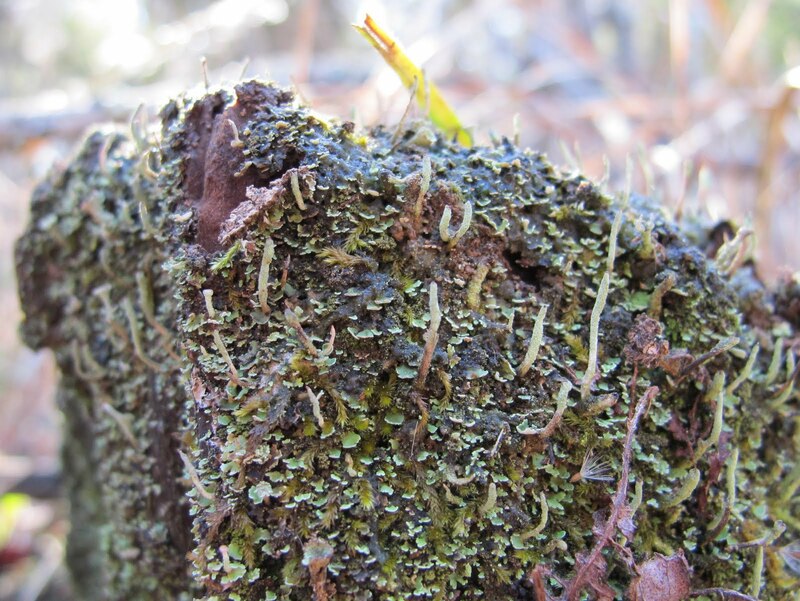 All cedars, both living and dead, support a diverse collection of mosses and lichens, but I think life on the old stumps may be the most diverse of all. This mass of growth looks like it could rival a coral reef in the number of species shoved into a small area. I don’t think I would cut big cedars just to create areas like this, but the action of someone in the past has produced some interesting results.